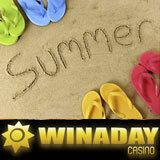 Summer is coming to an end and so are two special summer casino bonus offers at WinADay Casino. This week and next, players will still receive a 60% bonus on deposits made during Wednesday Happy Hours though, and next Monday is the last chance to receive a 20% -60% Monday Fever Bonus at the unique instant play casino. Every Wednesday this month, the Happy Hours casino bonus gives slot game players an extra 60% on each deposit made between 7 pm and midnight EST. Jacks or Better video poker is the August Game of the Month. Every 500 rounds played on this popular video poker game earns one ticket in a random draw. One lucky player will win a $250 bonus, another will win $100 and three more will get a $50 bonus each. Bonuses are doubled for VIP players who can win up to $500. Slots, video poker, roulette and keno -- WinADayCasino now has more than thirty one-of-a-kind casino games not available at any other casino. Most slot games are tied to the casino’s progressive jackpot, currently just over 100,000. This is good because even in summer, you can still purchase points and take advantage on its big bonuses.